I went to a freeway overpass by my house. I positioned myself at the center of the freeway. As I began to take pictures, it started to drizzle. The freeway was relatively empty. 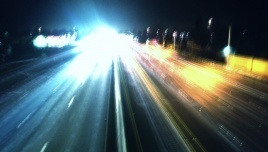 I used my iPhone with the apps SlowShutter and Snapsneed.